Snippets of Jack: "It's just good business." "You're mad." "Thank goodness for that, because if I wasn't this would probably never work." Its Just good business, famous last words of our beloved evil short man; Lord Cutler Beckett. 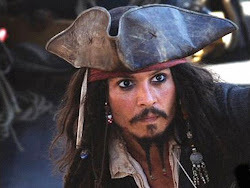 Who just happens to be in control of the 'East India Trading Company', the biggest hater of pirates in all of Great Britain. It doesn't seem like he and Jack would get along very well does it.? Well Jack does his best to ruin Cutler Beckett and in the end he succeeds. But not without a little evil planning and partnerships that always fail first. "Curious...your friends appear to be quite desperate, Jack. Perhaps they no longer believe that a gathering of squabbling pirates can defeat the Flying Dutchman. And so despair leads to betrayal. But you and I are no strangers to betrayal, are we?" 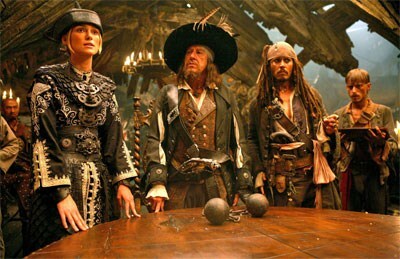 After making an agreement with Lord Beckett, Jack is summoned to the Brethren Court meeting at shipwreck cove. During this meeting Jack and the Court decide to fight...the entire British Navy. An interesting decision coming from a bunch of cowardly pirates. But they have a few tricks up their sleeves as usual. While Jack and the Brethren Court was planning their strategy, Lord Beckett was scolding Davy Jones. Beckett was in possession of a very valuable organ. The heart of Davy Jones. If Beckett stabbed said heart Davy Jones would perish and Lord Beckett would be in control of the ship and crew of Davy Jones, But thats not all; he would also be in control of the sea itself. "The Dutchman sails as its captain commands." "And its captain is to sail it as commanded. I would have thought you'd learned that when I ordered you to kill your pet. This is no longer your world, Jones. The immaterial has become...immaterial." Two day later the Navy of Great Britain and all the Ships of the Brethren Court met in the middle of the ocean, an began a battle one that would decide the fate of the ocean an all the ships that sailed her glorious waters. Out come the bag of tricks. The brethren court released A goddess that had been captured and placed in human form, we know her as Tia DaAlma; But her former lover Davy Jones knows her as Calypso goddess of the sea and everything in it. Her heart had been broken many years ago, by Davy Jones and this was her chance to get revenge. She fought on neither side; but the waves she controlled eventually helped the Brethren Court defeat Lord Beckett and Davy Jones. IN the end, The black Pearl blasted Lord Beckett's ship to pieces and sent hm to his watery grave.